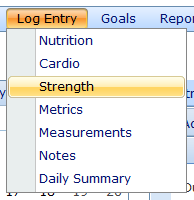 The strength log entry section is accessible from the Log Entry -> Strength menu item. It is distinquished from the cardio log entry by the ability to record exercises with multiple sets. 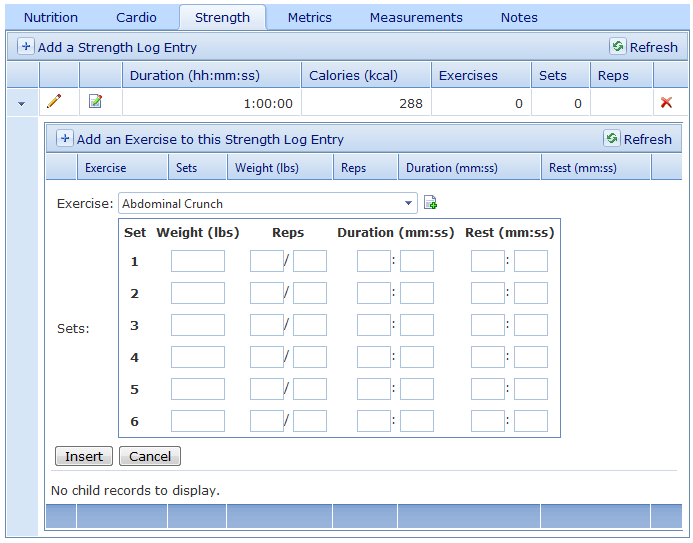 Creating a strength log entry is a multi-step process. First, you need to input the overall workout information, primarily the duration. This will allow calculation of calories burned for the workout and uses the METs value of 8.0, which is the standard for weight lifting. You can also enter calories, which will override the automatic calorie calculation in addition to general notes. If there are no strength log entries recorded for the selected day, the grid will automatically open in insert mode. If there are already strength log entries recorded for the selected day, the grid will display summary information for each record. You can then choose to add a new log entry by clicking the 'Add a Strength Log Entry' link, or edit any current record by clicking the pencil icon to the left of the record. You can also delete the record by clicking the 'X' icon to the right of the record. 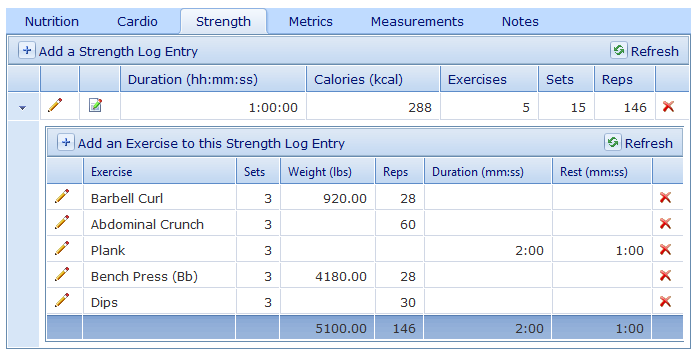 Once you have created your overall strength log record, you can start inputting the exercises for that log entry. If there are no exercises associated with the overall record, the grid will open up a new one in insert mode automatically, otherwise you can click the 'Add an Exercise to this Strength Log Entry link. Select your exercise, or click the + icon next to exercise to add a new custom exercise. Then enter the detail for that exercise and repeat. 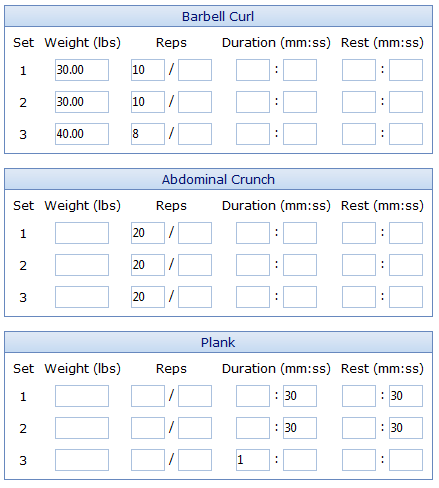 You can record up to 6 sets for each exercise with fields for weight, reps, duration and rest. Some exercises can be performed with complex rep patterns (such as up/downs, etc. ), which is why there are 2 inputs for reps. Typically, you will only use the first input. Here's what the grid will look like once the strength log entry has been completed. Each column shows totals for the values entered. You can click the pencil icon to the left of each exercise record to edit those values or click the x icon to the right to delete it completely. Once a strength log entry has been entered, you can quickly edit all the exercises on a single page by clicking the pencil on paper icon to the left of the log entry.